The other day Qiuting told me that I had been mentioned on RazorTv's latest show, titled Sponsor My Surgery. The episode basically revolves around blog sponsorships and more specifically for plastic surgeries such as in Xiaxue and Qiuting's case. My blog, along with Dawn Yang's, is listed at the bottom of the screen as examples. My first reaction was just that it was a gross exaggeration and misinformation, but didn't think too much of it. Then Qiuting said that her friend had asked her, "Eh your angmoh friend did plastic surgery also?" And I'm like?!?! (Some people said this might have been because I was listed along with Dawn Yang, who umm... haha may have had/has had but denies plastic surgery. Whatever) (And yes I know I'm not Angmoh, I am HALF Angmoh). I mean very obviously Razor Tv DID NOT do its homework at all, and must have very conveniently picked my blog because I'm a friend of Qiuting's. If they did, they would easily realise that I am NOT sponsored by anything! All I've ever done are advertorials and to be honest, I'm extremely new in this sector of the money-making blogging population. I started my first paying advertorials this year despite blogging for 5 years. Other bloggers have been doing this for ages. I may be getting sponsorships slowly yes, but at the moment if you look at my blog, I have NONE. (There's a difference between an advertorial and a sponsorship). About every other Nuffnang blogger out there has hair, nails, skincare, camera, clothes, etc sponsorships. WHY DID I GET DRAGGED INTO THIS?! You know, it is SO frustrating how sometimes the media likes to create content according to what it wants. The episode talks about how bloggers use their fame to get free things and whether this is ethical or not. Well what about selectively using content to be attention-grabbing? I'm not referring to big-time, "controversy theory" types of inaccuracies, but even the simple act of omitting certain footage/details can drastically alter the way a person is presented to the public. I mean how many times have we not seen scandalous footage of girls in e.g. the ANTM contests bitching about each other? Sometimes they can choose to show just one or two bad scenes of a contestant and bam! she's stuck with that image forever even if it may not be true. Back during the New Paper New Face days, I learnt of a few instances of inaccurate reporting. This is NOT to say that all reporters/newspapers/media in Singapore report inaccurately, but in my personal experience, articles about me got basic, stated facts such as my hometown in France completely wrong. "What do you think is your best feature?" "Well I think in general the eyes are the most important part of the face, because it's the first thing you notice and it's what can be the most captivating because they say a lot about a person." I was talking about eyes in general. When you look at a person, obviously the eyes stand out the most right? And they're captivating because they can convey emotions, as well as have a myriad of possible colour combinations, lines etc for the irises, eyelids, eyelashes etc... I mean as compared to a... nose. Well it's just there you know? You can be enthralled by a person's eyes, but not really their nose. "'I've been told my eyes are captivating,' she said shyly". This particular article even said "The 1.7m-tall student dreams of decking out in Chanel and Gucci on the gleaming catwalks of Paris and Milan". SERIOUSLY, where did they get that from?! I AM NOT THAT STUPID. Even if I really think so highly of myself, I still know politically correct answers. I may have only been 15 years old, but do you really think I'm so buay paiseh (a.k.a Not Shy) to say things like "I have a good memory" and "I've been told my eyes are captivating"?! Even if you think my own, original answers aren't good either, fact remains that I did NOT say the things they said I did. One thing to note is that they even "quote" me as if these are my exact words! During the competition I heard some things from other girls. "What do you think of Japanese boys?" Obviously startled, she only replied "Uh they're okay I guess". Meaning she has no particular preference for them, nor dislikes them. Well the profile painted of her was focused on how seemingly, she has this huge penchant/soft spot for Japanese boys. So if I randomly ask you if you like broccoli, and you go "uhh... they're ok"... How? Sophie, 15 year old student and broccoli lover! Don't let her shy demeanor fool you, this girl has a voracious appetite for her favourite vegetables; broccoli! Random photo to break the monotony of words. My mom kept a whole file of all the articles about me haha. From L-R: Straits Times mention (2005), New Paper about one year after my win (2006) and front page the day after I won (2005). (They really seemed to like the whole play of words with the "Sophie's The Choice" bit). And yah what the, I'm labelled as "star gymnast" -_- What if my CCA had been Librarian, then how? "Sophie Willocq, star librarian". Anyway the above articles are not the ones I'm complaining about. 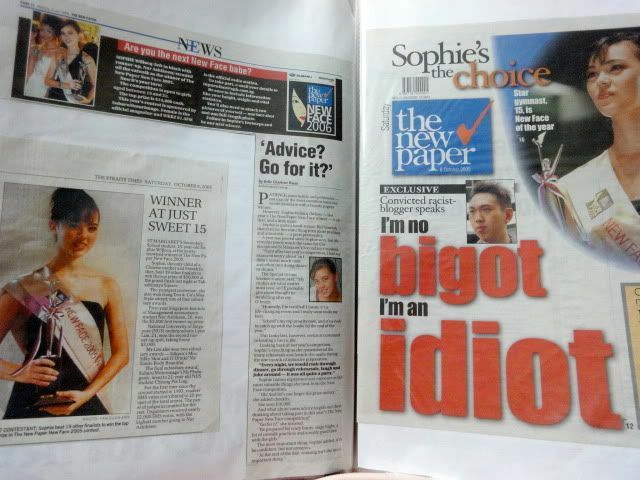 And yes I share the front page with the bigass words "bigot" and "idiot". Every time I look at it the only thing that stands out to me is the word "idiot". I was featured in some other articles that I'm glad to say, turned out completely fine. The interviewer did not distort anything and pretty much stayed accurate to whatever I said. I realise of course that the media needs INTERESTING news. But there are still boundaries to it. Alright I'm too tired to think beyond this. Got to get up in 7 hours! 8 comments on "The Media"
haha..the NewPaper is well known to be sensational? it is afterall a tabloid u know. oppa u freaking got banned on fs? lol, so sad, so what r u gna do now? ya my account got suspended. damn sian. but i can always make a new one? can you start a new blog thats fully dedicated to your daily routine/life? it's like no matter how mundane it actually is, you still have to write something. Hi Sophie, can you start a blog for me? Lolol. No matter how much you don't care about me, drop me a line or two. hi Qiuting! just wanna say i totally support your decision to go for that surgery. congrats! Acting like you care so much for being mentioned in the video. But didn't you feel a least of happy when your blog url is mentioned and when you can get free exposure? Anonymous: And you are the expert on blogs? So if a newspaper were to write a completely false and scandalous article about me, I should weep with gratitude just because they mention my blog URL? HUH?! And please, it's just RazorTv. You must have completely missed the point of my blog post because I talked about how the media does these things to get READER/VIEWERSHIP. Sounds familiar? Why don't they thank Qiuting for giving THEM free exposure then? Works both ways right?